Viktor Schauberger (1885-1958) possessed this rare gift. As a result of this, more than anyone else of his time he foresaw, as early as the 1920s, the environmental crises in which we are now engulfed. Viktor’s forebears had a long tradition of caring for the welfare of the natural forest and its wildlife in the Austrian Alps. Although he was born into a family that cherished unspoilt Nature, Viktor, like most pioneers, was the rebel amongst them. Viktor Schauberger recognized that Nature’s evolutionary purpose is to facilitate the emergence of higher life forms, to promote greater complexity of interrelationships and to raise the level of consciousness of the higher life forms, all a consequence of the continual refinement of energies. Viktor showed that highly ordered systems lose their stability when their environment suffers deterioration. He predicted that a decrease of biodiversity in Nature would bring an increase in violence and a degeneration of spiritual qualities in the human community. We think of evolution in terms of technological development. But if one aspect of potentiality is developed at the expense of the others, you end up with an unbalanced person, or even with a monster. This is one of the most important lessons our culture has to learn. It might well apply to the unregulated biotechnology industry. What level of crisis will be required to force us to rethink our priorities and change direction? Perhaps the most important of Schauberger’s insights that we have to heed is the importance of balance in Nature. The nature of some attribute of an organism, its wholeness or unity is composed of two seemingly opposed qualities in resonant balance. Thus, for example, both egoism and altruism are necessary as human qualities, but for evolution to proceed, altruism must be more in the ascendant.Because our culture has emphasized the coarser qualities, our creative evolution has been arrested, and we have attracted the darker energies of degeneration, with increasing disorder and violence as the outcome. Schauberger saw water as a pulsating, living substance that energizes all of life, both organic and inorganic. He called it ‘the life blood of the Earth.’ Whether as water, blood or sap (which are essentially water), it is the indispensable constituent of all life-forms, and its quality and temperature is fundamental to health. When it is healthy it has a complex structure that enables it to communicate information, carry energy, nutrients and healing, to self-cleanse and discharge wastes. He believed that one of the causes of the disintegration of our culture is our disrespect for and destruction of water, the bringer of life, for in doing so we destroy life itself. Viktor also profoundly believed that our dangerous technologies produce poor water that has lost its energy and its ability to pulsate — and is effectively lifeless. This dead water produces inadequate nutrition, and Viktor believed that its regressive energies are responsible for degenerative diseases like cancer, for lower intelligence and for community turmoil. Another cornerstone of Viktor’s ecotechnology is the importance of temperature in Nature’s processes. Modern technology creates vast amounts of waste heat (entropy) which contribute to global warming,especially in cities and industrial centres (carbon dioxide from burning fossil fuels being the principal source of global warming).Increasing heat will ultimately destroy life on Earth. Nature’s creativity, however, thrives on measured coolness.Most significantly, he showed how small variations in temperature are as crucial to the healthy movement of water and sap as they are to the human blood. He identified in particular the importance for water of the temperature of +4°C (39°F), referred to physically and chemically as the ‘anomaly point,’ when water is at its densest and has the greatest vitality, health and energy content. An understanding of motion may be the most important of Schauberger’s discoveries. Our current technology uses the wrong form of motion. Our machines and processes channel agents such as air, water, other liquids and gases into the type of motion that Nature uses only to decompose and dissolve matter. Nature uses another form of motion for creating and rebuilding. Our technology’s mode of motion creates chaos, noise and heat, bringing disease to organisms and the breakdown of structures. Visualize if you will, what happens in an explosion — matter is torn apart, fragmented and destroyed. Its effect is to create degraded energy. Through its dependence on the decomposing mode of motion our technology creates enormous energy pollution and entropy, dangerously affecting the vital biodiversity and balance of our ecosystems. Our mechanical, technological systems of motion are nearly all heat- and friction-inducing, with the fastest movement at the periphery (as in a wheel), a form of motion that is disintegrative, noisy and inefficient; this is the way we generate our power — centrifugally. By contrast, Nature uses the opposite, centripetal, vortical form of motion, moving from the outside to the inside with increasing velocity, which acts to cool, to condense, to structure, assisting the emergence of higher quality and more complex systems. Nature’s methods of producing energy are silent, but inherently far more effective and powerful than our mechanical techniques, as Schauberger was to prove with his implosion machines that produced prodigious amounts of power. The difference between the two forms of energy production is fundamental to the quality of any process in our world. Viktor Schauberger took the ancients’ view of the Sun as the maleinseminator of Earth to create bountiful Nature. But, also like the ancients, he saw Nature as the mirror of the Divine. Following Goethe’s eighteenth century view, he conceived of God as a kind of ‘Divine Weaver’ of the unfolding tapestry of Evolution. It was through this vision that Viktor found common ground also with the Austrian philosopher Rudolf Steiner. The vortex is a window between different qualities or levels of energy. Black Holes can be thought of as vortices linking different parts of our universe or even different universes. The vortex and spiral became hallmarks for Viktor Schauberger, as for him they were the key to all creative movement. As we shall demonstrate later, the vortex is most clearly seen with water, which it uses to purify and energize itself, introducing finer energies to wipe clean the bad energies of the water’s previous memory of misuse. Viktor Schauberger shows us that we need to think of energy in Nature as the potential for creation, not as a mechanical working process. He criticized our present view of how Nature works as untenably mechanistic, which he said this is one of the main reasons why we’re in such a mess. Our culture thinks of Nature as being like a big machine that can be manipulated and its resources extracted for our own greed, rather than a creative system that has a purpose. Nature uses egg-shapes to generate creative energies. The egg-shape became an important ingredient of his inventions. 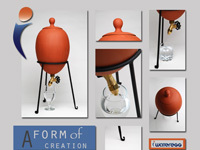 The egg is the only closed shape that will naturally generate vortical movement. Viktor Schauberger used egg-shaped compost piles to generate what he called ‘fructigenic’ energies, to stimulate plant growth. The egg-shape is found, especially in the leading edge of growth, in many organisms. The structure of the pine cone is also a good example of the egg-shape, though an elongated one. Its form is developed according to another strict geometric formula. When you examine the structure, you will see that the seed ‘wings’ form two opposing spirals. Moving from left to right (anti-clockwise) the descending (male) spirals complete three revolutions in the wavelengthof the cone; the eight ascending (female) spirals, rising to meet the male, are slower moving, completing only one revolution in the cone’s overall length. Where the male and female spirals intersect, a seed is born. “Today’s science thinks too primitively; indeed it could be said that its thinking is an octave too low. It has still not ventured far enough into the realm of energy, and its attitude has remained development was necessary, for how else should a misguided humanity perceive the true interdependencies? Buy an iWaterEgg from our affiliate organization. The water storage life-giving form for keeping water alive.